Texting, typing and technology in the lavatory – will wonders never cease? 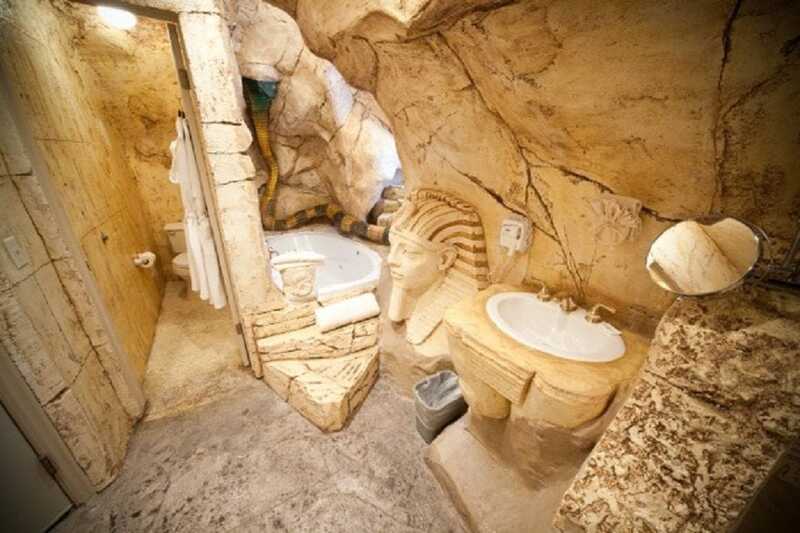 With bathrooms equipped for such things, the idea isn’t as odd as you might think. From outdoor shower outposts to tech-friendly toilet stalls, these hotel bathrooms are a working traveler’s dream come true. Scattered across the Southwest, here are 10 hotels (and the respective rooms/suites) with bathrooms fit for both working and washing. 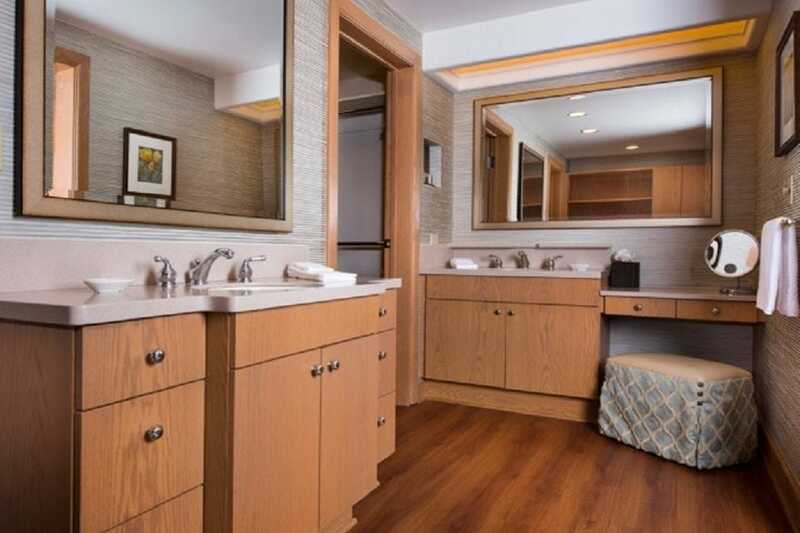 Choice bathroom: The Piñon Suite at Garden of the Gods boasts a bathroom featuring four separate spaces. Not only is there is a dual sink vanity, but another vanity loaded with outlets is just a few short feet away. An isolated toilet stall allows for some much-needed privacy in case someone else needs to shower, and a separate dressing closet offers enough storage for a dozen people. The list of amenities goes on and on from there, and we haven’t even stepped foot outside of the bathroom yet! Log hours: My goodness, this could be one of the largest hotel bathrooms in the Western United States. Between a morning cup of coffee at the makeup bar, super fast Wi-Fi and enough electrical outlets for a Christmas festival, this three-room bathroom suite is better equipped and more luxurious than most any office you’re likely to come across. Gateway Canyons Resort | Gateway, Colo. 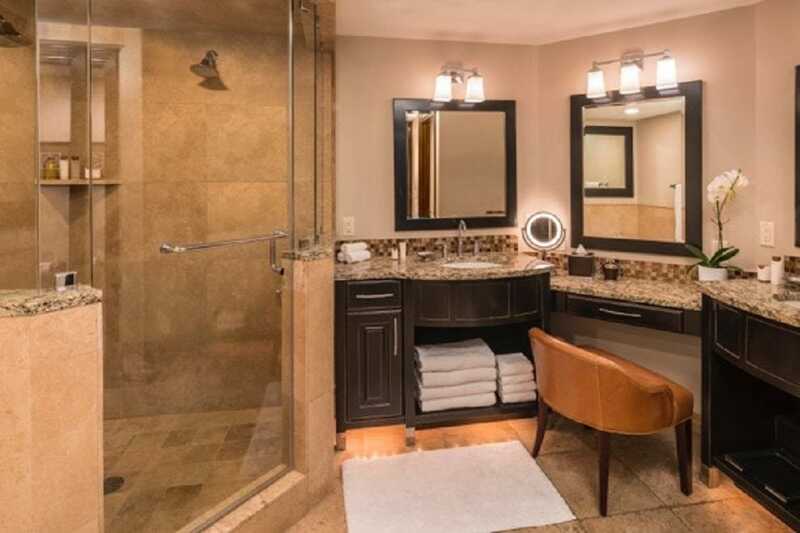 Choice bathroom: A Casita room at Gateway Canyons on the first level offers an outdoor shower and indoor bathroom complete with marble floors, granite countertops, opulent vanity mirrors, a step-in spacious shower, a water closet and enough space for a small gathering. Log hours: This bathroom is perfect for conference calls in the wee hours of the morning as you can easily escape to the outdoor garden shower with cascading vines along the stone, accompanied by unobstructed views of constellations or a spectacular sunrise. The bathroom itself is lavish, with a claw foot tub, water closet and step-in stone shower. However, the pièce de résistance is the exterior space, particularly that moment when your bare feet enter a haven of happiness and isolation. Type a story, have a glass of wine and shower among the stars in one of the nation’s most impressive indoor/outdoor bathrooms. The Little Nell | Aspen, Colo. Choice bathroom: The Little Nell Junior Suite boasts a steam shower, Jacuzzi soaking tub, dual stone vanities, June Jacobs spa amenities (new men’s line coming this winter), a separate water closet with phone line and 700-thread-count, plush cotton bath sheets, hand towels and washcloths. Not to mention, the marble flooring and walls are heated (think warm tushie while working). Log hours: This is Aspen, folks; it’s going to be borderline impossible to find a single place in town where you don’t want to log hours. However, for the parent of a napping child or for the man or woman who needs to get some serious work done, this is one Aspen retreat that you’ll be dreaming of for years to come. When the little ones start to stir and you still need to get some mileage added to that assignment, simply use kids’ bath amenities such as the bath mitten, animal towel and bath robes to let your tykes snuggle with in bed for a few more minutes while you continue to work. You might as well order a glass of wine from your porcelain palace as a post-work celebration. Log hours: Head directly for the tub. Don’t even fill it! Indulge in some chocolate and caramel-dipped pretzels or choose from a list of complimentary DVDs and order a movie snack pack. The Pharaoh themes are humorous, uplifting, spiritual and, at times, make you feel like you’re in a real pyramid. You’ll take in the Egyptian charm as you apply modern-day tools to your craft such as Wi-Fi, television and a DVD player. Plus, when you’re done, reward yourself with an incredible soak in the tub or take a shower, but be sure to watch out for the snake! Choice room: You can’t go wrong with the Deluxe Patio Farm Suite. This incredible oasisin the middle of Albuquerque’s arid landscape is surrounded by 40 acres of lavender. And the suites are housed in their own 1930’s dairy-style buildings with tin roofs and white-stuccoed walls. The Farm Suites offer wood burning fireplaces, original artwork, hardwood floors and gorgeous views of the gardens, acequias and the lotus pond. Log hours: You’re here for one reason: to be inspired by the aromas of the farm. I spent close to three hours one mid-summer afternoon – during a two-child nap – working away on my laptop in the contemporary, white, sleek bathroom while soaking my feet in the bathtub filled with the resort’s lavender products. As the flowers’ powers unleashed their relaxation, I happily typed while constantly gazing out the window above the bathtub to the vegetation blowing in the breeze. L’Auberge de Sedona | Sedona, Ariz. Choice bathroom: Cottage Suite at L’Auberge in Sedona. The marble bathroom has an oversized Jacuzzi tub, steam shower and an oversized window that looks out toward the red rock mountain horizon. The best part is the outdoor, open-roof cedar shower located on the suite’s private balcony. 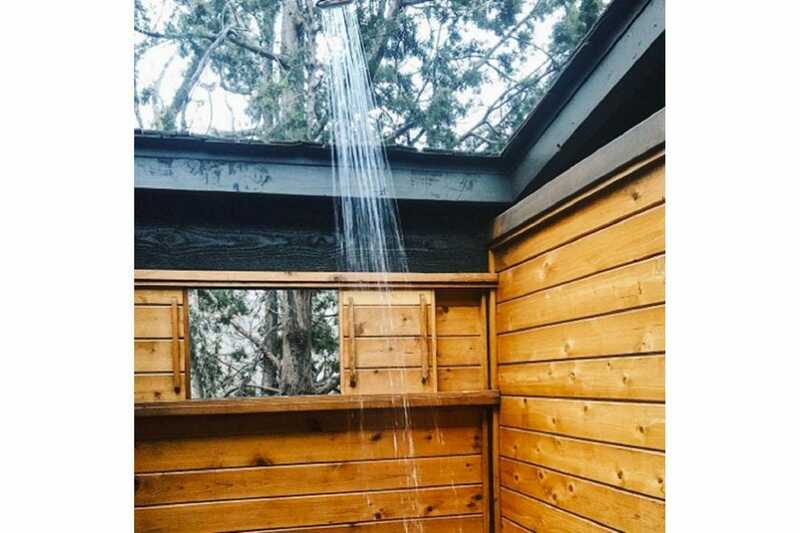 Log hours: There’s something about an outdoor shower; it gives you the flexibility of holding an open-air meeting while others might sleep, or to catch a shooting star while adding last-minute notes to an agenda. The stars and sunrises are spectacular, and the smell of the cedar always soothing. Due to hot desert temps, working in the early morning and late evening are a special treat to catch a cool breeze often lacking during the day. Warm up when you’re done with a hot shower! Sanctuary on Camelback Mountain | Paradise Valley, Ariz. Choice bathroom: The Camelback Casita bathrooms have the Midas touch – polished, floor-to-ceiling tiles reflect the sun and change colors depending on the sun’s (and your room’s) position. Nonetheless, for this writer, it’s that natural, outside element, that brings magic. 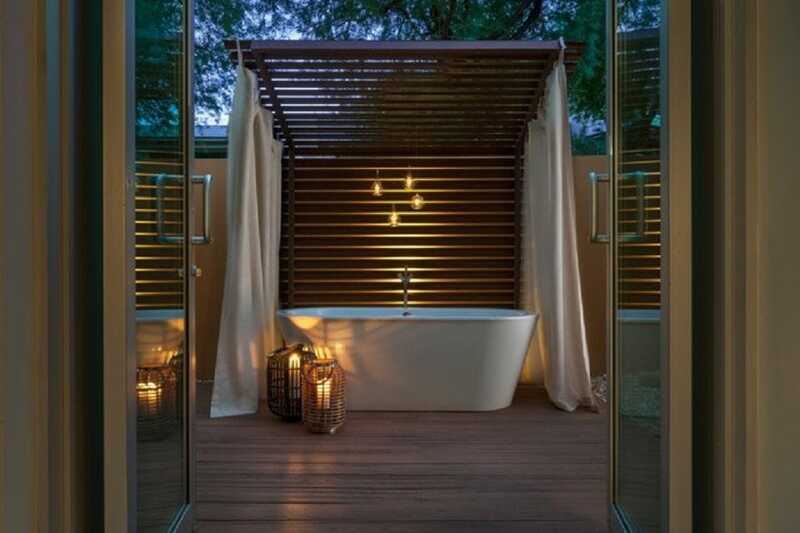 The Spa Suite has an outdoor bath so you can enjoy bubbles under the stars in complete privacy. Log hours: If you must work during the day, and from the bathroom, while say a child is napping from the glorious hours of 1 pm to 4 pm, why can’t you partake in some of the sun’s magic as well? Plop on the floor, plug in and, as you type, watch the solar power change your surroundings. It’s something extremely unique and spiritual. Of course, the outside soaking tub has much potential as a workspace, reading nook and even Snapchat backdrop. Four Seasons Resort Scottsdale at Troon North | Scottsdale, Ariz. Choice bathroom: Set on the property’s highest point, the three-bedroom Pinnacle Suite offers three full bathrooms, two outdoor garden showers and a guest powder room with shower. The full bathroom in the main suite bedroom offers hand-painted sinks from Mexico, a deep soaking tub and private outdoor garden shower, framed in latilla. Log hours: Enjoy Scottsdale’s 330 days of sunshine by basking in a relaxing sunrise shower or glimpse the stars with an evening soak in the tub. Plenty of natural light soaks in through the floor-to-ceiling shower windows, which frame the tub. Choice bathroom: The one-bedroom whirlpool suite bathroom at Waldorf Astoria is a must in the outdoor adventure mecca of Park City. 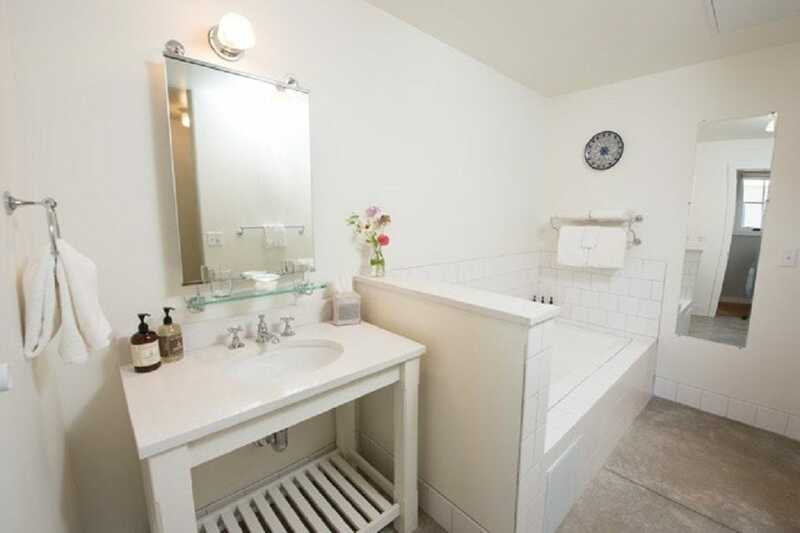 It features Salvatore Ferragamo bathroom amenities and a jetted garden tub fit for two. There’s also an European shower featuring two showerheads, two sinks with a lower vanity in between and a private water closet. Best perk: the bathrooms also feature a flat screen. Log hours: With one of the few televisions in the toilet, this bathroom offers an enormous amount of work time opportunity while catching up on the news and headlines. The Waldorf Astoria brand is known for its remarkably luxurious accommodations and perks worldwide, so this Southwest bathroom abode won’t disappoint. Choice bathroom: Designed by Adam Tihany, each penthouse bathroom in this Dallashotel varies in layout and design with features that include floor-to-ceiling windows offering exquisite views and natural light, an oversized freestanding tub, rainfall shower, heated Toto toilet and an array of products from The Spa at The Joule. Log hours: Take a soak in the freestanding tub or set up shop in the shower. There are plenty of views and uplifting light from the enormous windows.